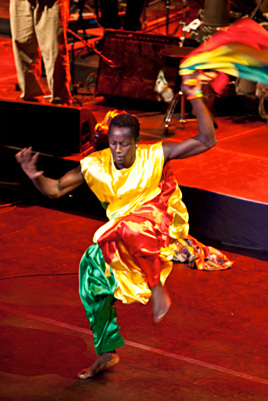 Abdou Sarr is a dancer from Senegal, West Africa. Abdou is extraordinary, dynamic and very engaging. He speaks English fluently and is currently dancing with highly respected performing groups in Massachusetts who do arts in education programming: Tony Vacca's World Rhythms and Bamidele Dancers and Drummers. Since his arrival in the US, he has been busy dancing, making Senegalese clothing, taking additional English classes, raising a family, helping his family back home and traveling with World Rhythms and Arts Are Essential, Inc. for the Senegal America Project, a cultural educational exchange program. Abdou is a master teacher of the sabaar and djembe dances from Senegal, West Africa. He is Senegalese and can speak to the culture and life in Senegal and his journey to the U.S. with your students. The students will become proficient in the dances and will be able to perform them for their peers. Please contact: Jean Butler at 978-263-0108 or jean@arts-are-essential.org for more information on bringing Abdou to your students.